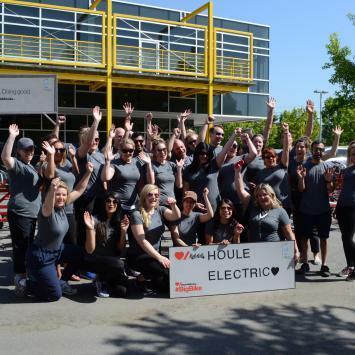 Houle has a strong corporate culture of community involvement. Sharing our skills and resources with the communities where we live, work, and do business is a key element of our corporate responsibility. With our commitment to serve and strengthen our communities, our company and employees have donated vast amounts of time, money, and supplies to many exceptional causes. Committed to building better communities in the areas where we live and work, we help to strengthen our community through monetary donations in the areas of health, athletics, education, and community welfare. 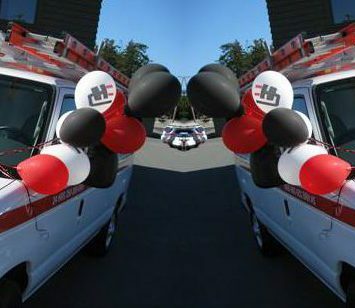 Health – We focus on supporting credible and recognized provincial and national health charities. We all benefit with better health in our families and our communities. Athletics – We believe that athletics provide opportunities for self-discipline and teamwork for people of all generations. Our support of local sports team helps to build and encourage sportsmanship at all levels. Education – We believe that the best way to ensure a strong future for our community and our country is to invest in the education of our young people and their potential. 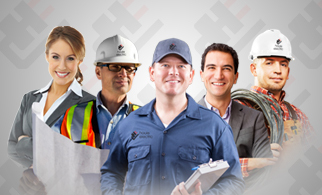 We support secondary and post-secondary education in the trades. Community Welfare – We believe in being a part of a caring community where no one goes hungry or is homeless. We contribute by supporting charities that focus on hunger, poverty and homelessness. 900+ employees across British Columbia, all coming together to make meaningful differences in our community. Read our stories below. 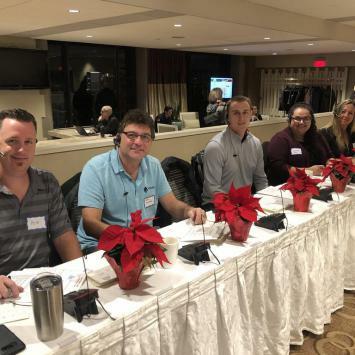 December 2018 Some Houle employees were up early on December 4, 2018 answering calls for the CKNW Kids’ Funds which supports children living with physical, mental, and social challenges in BC. 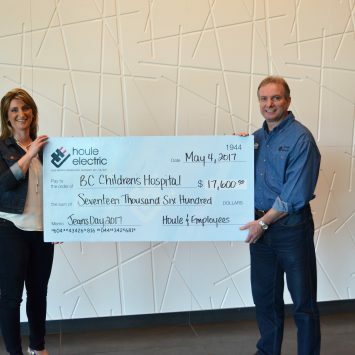 Houle was happy to donate $12,289 from our employees to this great cause! October 2018 Houle is one again proud to participate and fundraise for Big Bike, an initiative by the Heart & Stroke Foundation who’s vision is for people to live healthy lives free of heart disease and stroke. Our 29 amazing Houle riders raised $3,852 to help fund the critical research to prevent heart disease and stroke. 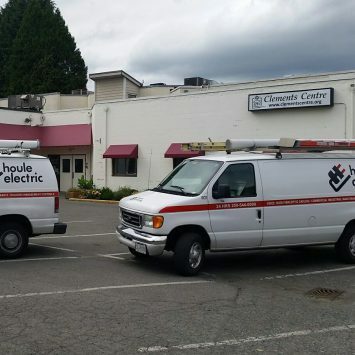 February 2018 On February 20th, the faculty from Camosun College and members of the Vancouver Island Construction Association, along with the International Brotherhood of Electrical Workers – 230, and a number of other stakeholder groups came together to celebrate the official grand-opening celebration of the new Lionel Houle Electrical Shop at Camosun College. Robert Lashin, Houle’s Chief Executive Officer, addressed the crowd at Camosun College’s Interurban Campus to kick off the momentous event. 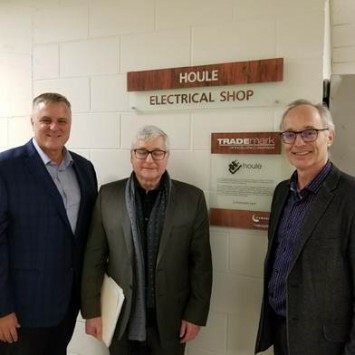 The naming of the shop, after Houle’s late founder, Lionel Houle who started the company in 1944 in Port Alberni, reflects the commitment by the firm, of $75,000, to the school. Camosun’s electrical program trains 100 foundation students and 600 apprentices at any given time, and the shop has doubled in size. September 2017 Owen Crumpler came into this world almost three and a half months earlier than anticipated. Weighing only 2lbs 2ounces at birth, Owen spent the next 4 months fighting for his life at BC Children’s Hospital. During an MRI of his brain, Owen’s parents, Michael and Karena learnt the heartbreaking news that Owen’s developing brain suffered oxygen deprivation causing neurological impairment to Owen’s brain. Owen was diagnosed with quad spastic Cerebral Palsy. This condition affects his gross and fine motor control. That was 9 years ago. Today, Owen communicates through difference means other than words. He uses a wheelchair to get around. He eats with the help of a feeding tube. He enjoys many activities like other 9-year-old boys his age. He bikes using an adapted bicycle. He dances through the Dance Without Limits program. 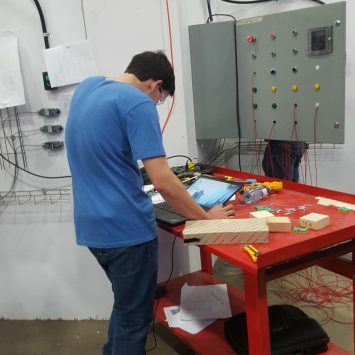 He attends school, communicating with his friends through technology such as the iPad and voice switches. Owen rolls with the punches and always come out stronger. 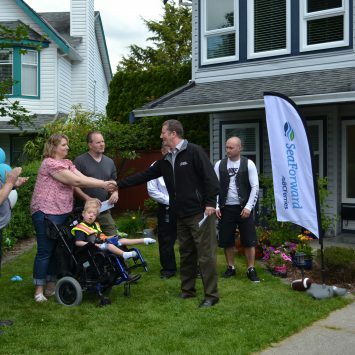 For the second year in a row, Houle is not only supporting Victoria Service Electrician Michael Crumpler and his family through participating in Steptember, but to all families affected by cerebral palsy. 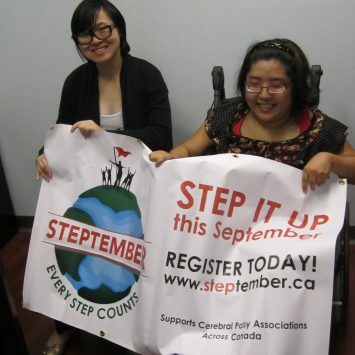 Run by the Cerebral Palsy Associations Canada wide, the Steptember charity event challenges people to take 10,000 steps (or the equivalent) a day for 28 days straight in the month of September. Houle employees will track every step they take to support and raise vital funds for children and adults with cerebral palsy. All monies raised through Steptember will go to the BC Cerebral Palsy Association. For Houle, it is about supporting a fellow employee and giving back to a worthy cause. July 2017 The beautiful Blackie Spit, at Crescent Beach in South Surrey, was filled once again with paddlers for the 2017 Champion of the Crescent stand up paddle board event. This popular event is a race to support and raise awareness of kid’s mental health. Houle was proud to put in a team again this year. The event raised more than $155,000 for kids’ mental health programs serving children and youth from across the Fraser Valley. June 2017 Five year old Jack Cholette has a rare genetic condition that has left him legally blind, hearing impaired, and unable to stand on his own. As Jack got older, the Cholette family found it increasingly difficult to transport Jack to the main living area of their home. A wheelchair lift was needed in the Cholette home. 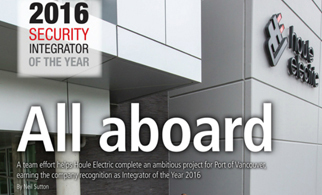 Coming together to help the Cholette family, BC Ferries provided the stair lift, Angel Accessibility installed the chair, and Houle donated time to complete the electrical work for the installation. As part of this strong and vibrant community, Houle is always ready to give back any way we can to support those in need. 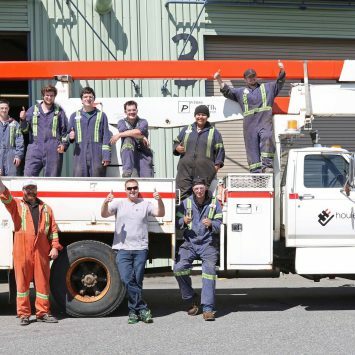 June 2017 Houle recently donated a bucket truck to the Vancouver Island University trades program. The Heavy Mechanical Trades Foundation Program at VIU provides basic training to students, covering aspects including safety; tools; computer; and service and maintenance for truck, buses, and heavy equipment. Houle is excited to see how this truck will provide more hands-on learning opportunities for the Heavy Mechanical Trades students. May 2017 20 minutes. 29 riders. One Big Bike. All in support of achieving the Heart & Stroke Foundation’s shared vision: Healthy lives free of heart disease and stroke. 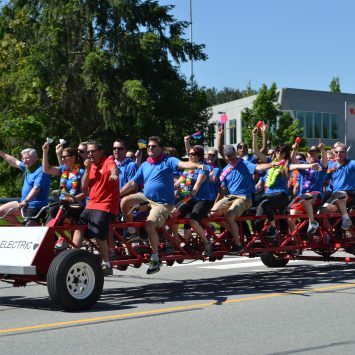 Houle was proud to participate and fundraise for Big Bike, an event that supports critical heart disease and stroke research. For Houle, it was about helping an organization work to save thousands of lives and improve the lives of millions of others. May 2017 Each day across BC, children and youth diagnosed with childhood diseases are fighting for their lives. To help the Excellence in Child Health Fund provide critical support to the programs and services provided by BC Children’s Hospital, Sunny Hill Health Centre for Children, and the Research Institute, Houle employees have once again #JeanUp for the 2017 Jeans Day Campaign. With everyone’s support, Houle’s 2017 Jeans Day Campaign raised $17,600! Houle is proud to help give our children the best chance for a healthy future. May 2017 Houle believes an investment in education today can help students pursue goals which otherwise might have been unattainable. Houle is therefore proud to continue its support of the Camosun College Foundation. 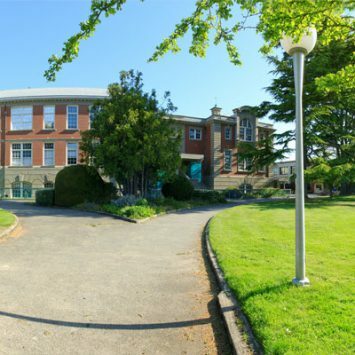 Camosun’s School of Trades & Technology offers a wide variety of programs and courses to help students receive the education necessary to succeed in today’s competitive job market and challenged economy. Houle looks forward to seeing more Camosun grads excel in the trades and technology disciplines and continue the growth of our industry! 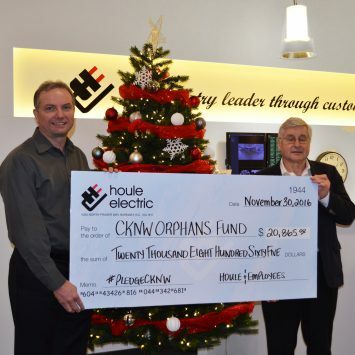 December 2016 Houle and its employees got into the holiday spirit in a big way by donating $20,865 to the CKNW Orphan’s Fund — our largest single donation to a charity to-date. Employee donations totaled an astounding $10,865, and Houle added an additional $10,000. Houle President Robert Lashin stopped by the live broadcast of #PledgeCKNW to drop off the donation, and took a few minutes to chat. “Sometimes all that people need is to know that other people care for them,” he says. Listen to his interview. 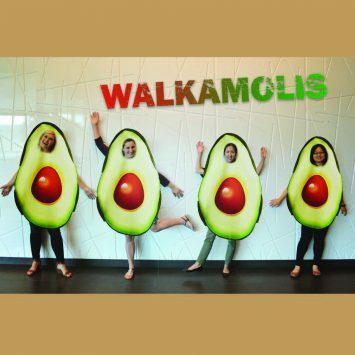 September 2016 All Houle regional offices were challenged to “Step it Up” and track the number of steps that were taken each day, while raising funds from family, friends, and co-workers for the Cerebral Palsy Association of British Columbia (CPABC). The CPABC’s vision is to create a ‘Life Without Limits’ for people with cerebral palsy to reach their maximum potential within society. August 2016 Recently, the Victoria office supported two great organizations in their time of need: The Clements Centre and Sundrops Centre in Duncan. These centres offer support services for persons and children with developmental disabilities. After hearing a news release on social media stating that the curator of the facility was looking into installing a CCTV system to backup their existing security measures as a response to a break-in, three Houle employees decided to approach the centre with an offer to assist. Houle provided the Centres with a professionally installed IP CCTV system, complete with NVR and 4 strategically located IP cameras. The labour was donated by the technicians (on a weekend to avoid conflict with the Centres’ patrons), with Houle donating permits and extraneous supplies, leaving the customer with a bill of the cost of the equipment only, saving them a lot of money. 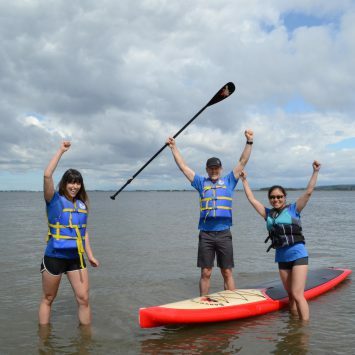 July 2016 Houle was proud to sponsor the Champion of the Crescent stand-up paddle race in support of youth mental health. 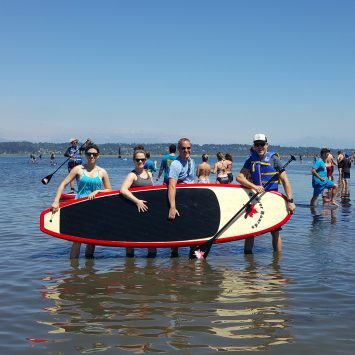 The even saw over 200 pro and amateur paddle boarders gather at Blackie Spit Park in White Rock to race in different heats. Houle even entered a team of four in the corporate relay category and placed 3rd in our heat! The event raised more than $128,000 for the Child and Adolescent Psychiatric Stabilization Unit (CAPSU), a new mental health facility that is scheduled to open at Surrey Memorial Hospital in 2017. 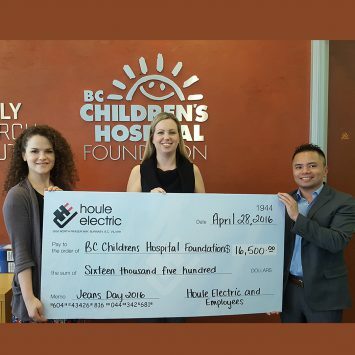 April 2016 Houle employees once again opened up their wallets for this years’ Jeans Day campaign, an event that raises funds for the BC Children’s Hospital Foundation. Houle matched every dollar that was donated by employees and $1 per like and share on Facebook. 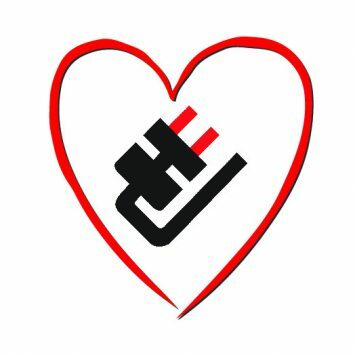 February 2016 With February being Heart Month, Houle organized a Valentine’s Day breakfast fundraiser at the corporate head office to raise money to support the Heart and Stroke Foundation. Not only was some delicious food enjoyed, it was a good opportunity to raise funds for an organization that impact the lives of all Canadians. 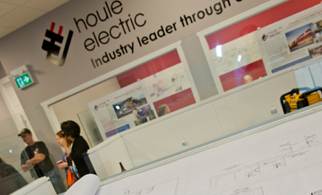 March 2016 To support students training in the electrical field and help to ensure a positive future for our industry, Houle has set up the Houle Electric Top Electrical Foundation Program Achievement Award. This award is given to a student in the Electrical Foundation Program at Camosun College who has demonstrated high academic and practical marks, shown good time management, and has a positive attitude towards learning. 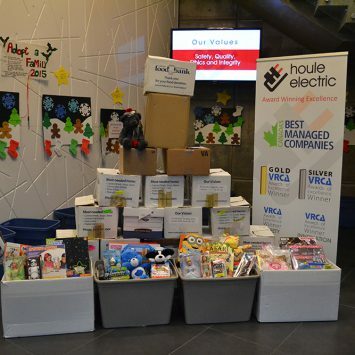 December 2015 Houle participated in the Christmas Bureau’s Adopt-A-Family Program, a program that provides low-income families with toys, stocking stuffers, and groceries during the Christmas season. It started out with one family being sponsored by the Burnaby Head Office in 2013 to all regions in Houle participating in this great charity the following years. This year, with some regions sponsored multiple families. 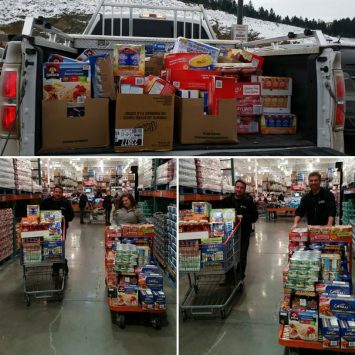 December 2015 To support the good work local food banks do in helping those in need in their communities, Houle Kamloops once again donated food to food banks and food shelves during the CP Holiday Train event. This event helps to shine a light on the important role food banks play in a healthy community. 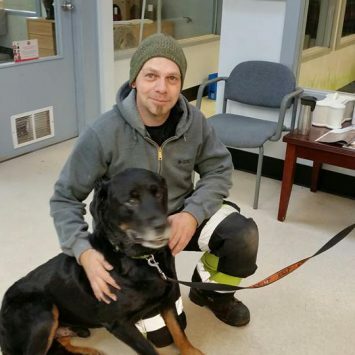 November 2015 To do our little part for the great work that the SPCA does for our furry friends, Houle pitched in to perform some repairs to the Kamloops SPCA facility. This support enables the SPCA to continue to provide a comfortable shelter to the many homeless and neglected animals that they help each year. 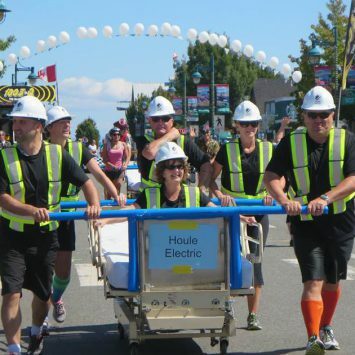 August 2015 The Houle Victoria team participated in the fun and exhilarating Bed Races on Beacon charity event that raises funds for palliative care at Rest Haven Lodge. Dressed in crazy costumes, the team raced their hospital beds on Beacon Avenue in Sidney, all for a great cause. 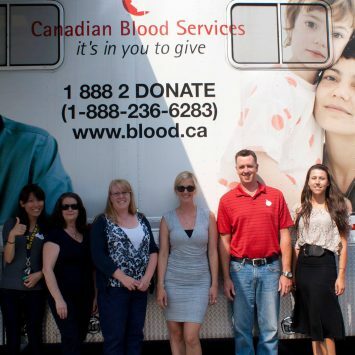 June 2014 To use our power to give life, Houle coordinated a mobile clinic from the Canadian Blood Services to come to the Corporate Head Office. Employees gave a bit of themselves and donated blood so that we could help to change someone’s life. 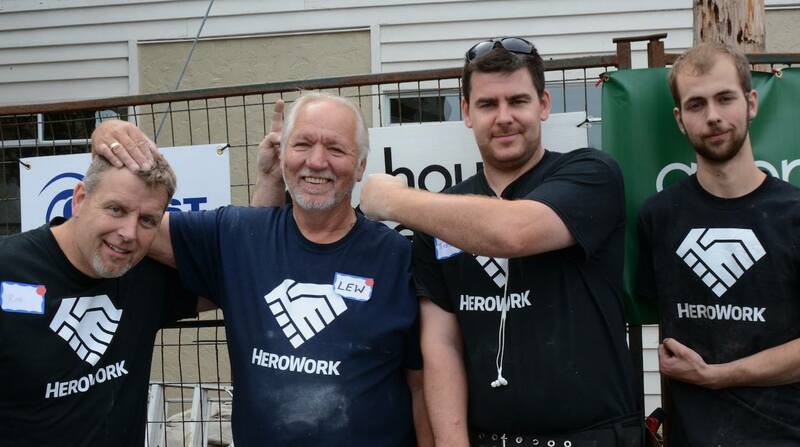 September 2014 Houle once again donated their time to HeroWork, this year renovating Threshold Housing Society, a 4-plex to provide housing for at-risk youth. 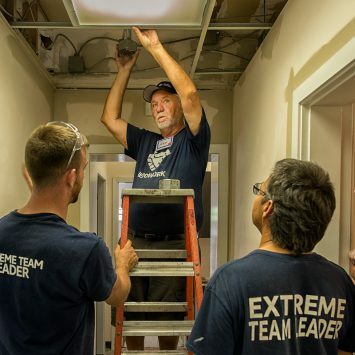 Employees used their own time and resources to help create a safe and stable home environment for our community’s vulnerable youth. November 2013 Houle employees sported their mustaches around the offices and in the field in order to fundraise for the Movember Foundation, an annual event that encourages men to grow mustaches to raise awareness of men’s health issues, such as prostate cancer, testicular cancer, and mental health. September 2013 Houle took part in a HeroWork project in Victoria, BC. The project consisted of an extreme makeover of the Mustard Seed Food Bank valued at $500,000. In addition to the electrical permit and materials, over 300 man hours were donated to this project by Houle employees who worked evenings and weekends to complete this project. Our vision, mission, and values define who we are. It provides the framework for what drives our organization, conveying our purpose, direction, and driving forces of our organization. Looking for a career that is both challenging and rewarding? Do you want to be part of a team that genuinely cares about your career growth? Join Houle’s ‘One Team’ and be empowered to own your work. There are always exciting developments happening at Houle. Find out what is making the latest headlines at the company.